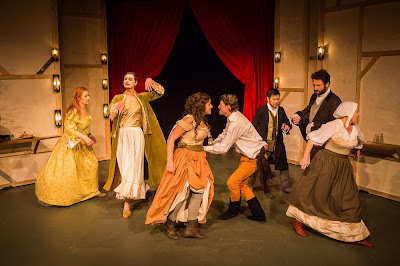 New Theatre presents, NELL GWYNN, by Jessica Swale, at the New Theatre, King St, Newtown. 8th August - 8th September. NELL GWYNN, is a British play by Jessica Swale. The play won the Olivier Award for Best New Comedy in 2016. The play in a very large number of short scenes - it is in two acts and is almost three hours long - brings to life the career of Nell Gwynn (Bishanyia Vincent), a young woman who grew up in Cheapside experiencing the rough side of life with her 'old Ma Gwynn' (Susan Jordan) and sister, Rose (Eleanor Ryan). The sisters became orange sellers (!) in the Kings Playhouse, Nell attracting the amorous attention of the leading actor, Charles Hart (Rupert Reid), who besides 'bedding' her, encouraged and trained her in the Arts of Acting - with the Restoration of Charles II to the English throne, amongst many sweeping reforms, he permitted women onto the stage, which he had become enamoured of in his European (French) exile. Nell first appeared in John Dryden's (Steve Corner) INDIAN EMPEROR at the age of 15, and over time became a leading comic actress: "pretty witty Nell" as Samuel Pepys recorded in his famous diary of the times. At the age of 17 she became the mistress of the King, Charles, in 1668, and grew a loyal place in the heat and heart of the King, who ensured that even after his death (1685) she would be kept: "Let not poor Nelly starve" his last words, it seems. The heir to the throne, James II, in brotherly respect, paid off her debts, which she had accrued through a very generous life style, and gave her a pension. She died at the age of 37 - well beloved by the public. This comic invention by Jessica Swale, creates a feisty young woman of wit and charm, giving the episodic development, a modern-day 'spin' of a 'feminist' at work in a patriarchal world. The writing style is briskly modern and, relatively, lightly sophisticated - straight to its contemporary 'political' points. It has the repartee of amusing banter - badinage - 'down flat', able to be grasped by all, mildly similar to that of the cheeky pertness of Richard Curtis and Ben Elton's television series, BLACKADDER, starring Rowan Atkinson. Ms Swale's play does not at all reflect the language of the period, the complicated comic circumlocutions of the actual Restoration play e.g. Wycherly's, THE COUNTRY WIFE (1675), Etherege's, THE MAN OF MODE (1676), Aphra Behn's, THE ROVER*** (1677) or, Congreve's, LOVE FOR LOVE (1695), nor the contemporary brilliance of writer, Stephen Jeffreys', exampled in his play of the Restoration Theatre: THE LIBERTINE*** (1994) - which, generally, in this modern world, seems to be a literary and comprehension challenge, both, for most contemporary actors and contemporary audiences, with their technical skills dictated by the iPhone twittering in their back pockets, training and gratifying their short attention spans by prohibiting their ability to speak, communicate, listen beyond a certain number of allowable words! - letters of the alphabet, is it? The Director of this production, Deborah Jones, has taken on the challenge of the episodic structure and many Set locations of NELL GYNN, (Set Design, by John Cervenka), that requires a cast of 16 actors in Restoration 'drag', being verbally witty, and occasionally having to sing and dance (Choreography, by Virginia Ferris). Ms Jones copes within the limits of budget and available talent, and for the most part delivers a very pleasant winter's night in the theatre - although, the clothing defeats her and her Costume Designer, Deborah Mulhall - it is, collectively, a visual 'nightmare', individually, though, some good work - and one felt that the last hour or so of the play needed more rehearsal - attention - as it began to lag in contrast to its earlier energy and crispness - as an audience member one began to tire. Bishanyia Vincent has the intelligence and attractive light witty comic style to sustain the journey of Nell throughout the play - to be its, necessary beating heart - and handles her surrounding supporting actors with generosity and good sense. There is, especially, good theatrical 'chemistry' between her and Rupert Reid, who warmly creates a man of patience and gentle wit - it is not so obvious with her other major partner, Lloyd Allison-Young, as Charles II, who gives offers to his partners in the play but rarely receives, listens, or is affected by the return gestures. Steven Ljubovic, as the displaced actor, who has impersonated the women in the company's plays - Edward Kynaston - is amusing; Shan-Ree Tan, in a fairly thankless role as theatre company manager, Thomas Killigrew, creates an impression, as does Eleanor Ryan in a non-comic role in a comic play. All the company seem to be having a good time and that is infectious to the 'colour' of the production for their audience. NELL GWYNN, is a light-weight comedy easy to digest. One wishes that Ms Swales' character had some of the verbal grit (feminist grit) that Elizabeth Barry, another actress of the Restoration period, had in Stephen Jeffereys' play, THE LIBERTINE. We have seen other female characters of the stage of the Restoration period in PLAYHOUSE CREATURES***, by April De Angelis (1993), that gave us Mrs Betterton and another version of Nell Gwynn. There is still another woman who made her mark in what once was an exclusive realm of the man, Anne Bracegirdle - and, with such a nomenclature could be an interesting exploration. Thank goodness for the 'small' theatres in Sydney (supported by the artists without recompense - because of their necessary need to practice their craft), that curate contemporary work for Sydney audiences from the bigger world, that otherwise in this self-proclaimed INTERNATIONAL CITY would never be seen. Is it enough to have an architectural wonder, such as Utzen's so called Opera House, to draw the international tourist, to declare that Sydney is a cultural destination of note or importance? - I don't think so. I mean, that building is a wonder but what happens inside it is often an embarrassment of a wonder of another kind. My international guests are often startled with shock and disappointment. One, further, does wonder about what are on the Sydney Theatre Company stages (DINNER***) and at the Belvoir- A TASTE OF HONEY***, at times, as well, with such good contemporary writing available.